USES: Ranitidine is used to treat ulcers of the stomach and intestines and prevent them from returning after treatment. This medication is also used to treat and prevent certain stomach and throat (esophagus) problems caused by too much stomach acid (e.g., Zollinger-Ellison syndrome, erosive esophagitis) or a backward flow of stomach acid into the esophagus (gastroesophageal reflux disease-GERD). 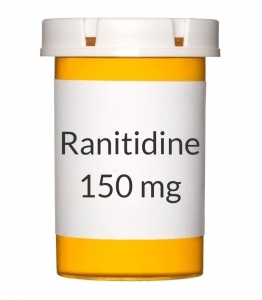 Ranitidine is known as an H2 histamine blocker. It works by reducing the amount of acid in your stomach. This helps heal and prevent ulcers and improves symptoms such as heartburn and stomach pain. This medication is also available without a prescription. It is used to prevent and treat heartburn and other symptoms caused by too much acid in the stomach (acid indigestion). If you are taking this medication for self-treatment, it is important to read the manufacturer's package instructions carefully so you know when to consult your doctor or pharmacist. HOW TO USE: Take this medication by mouth with or without food, usually once or twice daily or as directed by your doctor. It may be prescribed 4 times a day for some conditions. If you are taking this medication once daily, it is usually taken after the evening meal or before bedtime. The dosage and length of treatment are based on your medical condition and response to therapy. In children, dosage may also be based on body weight. Follow your doctor's instructions carefully. You may take other medications (e.g., antacids) for your condition as recommended by your doctor. Take this medication regularly in order to get the most benefit from it. To help you remember, take it at the same time(s) each day. Do not increase your dose or take it more often than prescribed. Do not stop taking this without your doctor's approval because this may delay healing of the ulcer. If you are using nonprescription ranitidine for self-treatment of acid indigestion or heartburn, take 1 tablet by mouth with a glass of water as needed. To prevent heartburn, take 1 tablet by mouth with a glass of water 30-60 minutes before eating food or drinking beverages that cause heartburn. Do not take more than 2 tablets in 24 hours unless directed by your doctor. Do not take for more than 14 days in a row without talking with your doctor. Inform your doctor if your condition does not improve or if it worsens. SIDE EFFECTS: Headache, dizziness, constipation or diarrhea may occur. If any of these effects persist or worsen, notify your doctor or pharmacist promptly. If your doctor has directed you to use this medication, remember that he or she has judged that the benefit to you is greater than the risk of side effects. Many people using this medication do not have serious side effects. Tell your doctor immediately if any of these unlikely but serious side effects occur: blurred vision, mental/mood changes (e.g., agitation, confusion, depression, hallucinations). Tell your doctor immediately if any of these rare but very serious side effects occur: easy bleeding/bruising, enlarged breasts, severe tiredness, fast/slow/irregular heartbeat, signs of infection (e.g., fever, persistent sore throat, cough), severe stomach/abdominal pain, dark urine, yellowing skin/eyes. A very serious allergic reaction to this drug is unlikely, but seek immediate medical attention if it occurs. Symptoms of a serious allergic reaction include: rash, itching/swelling (especially of the face/tongue/throat), severe dizziness, trouble breathing. This is not a complete list of possible side effects. If you notice other effects not listed above, contact your doctor or pharmacist. In the US - Call your doctor for medical advice about side effects. You may report side effects to FDA at 1-800-FDA-1088. In Canada - Call your doctor for medical advice about side effects. You may report side effects to Health Canada at 1-866-234-2345. PRECAUTIONS: Before taking ranitidine, tell your doctor or pharmacist if you are allergic to it; or to other H2 histamine blockers (e.g., cimetidine, famotidine); or if you have any other allergies. This product may contain inactive ingredients, which can cause allergic reactions or other problems. Talk to your pharmacist for more details. This medication should not be used if you have certain medical conditions. Before using this medicine, consult your doctor or pharmacist if you have: a certain blood disorder (porphyria). Before using this medication, tell your doctor or pharmacist your medical history, especially of: immune system problems, kidney problems, liver problems, lung diseases (e.g., asthma, chronic obstructive pulmonary disease-COPD), other stomach problems (e.g., tumors). Some symptoms may actually be signs of a more serious condition. Tell your doctor immediately if you have: heartburn combined with lightheadedness/sweating/dizziness, chest pain or shoulder/jaw pain (especially with trouble breathing), pain spreading to arms/neck/shoulders, unexplained weight loss. This drug may make you dizzy. Do not drive, use machinery, or do any activity that requires alertness until you are sure you can perform such activities safely. Limit alcoholic beverages. Do not use to treat children younger than 12 unless directed by the doctor. Kidney function declines as you grow older. This medication is removed by the kidneys. Therefore, elderly people may be at greater risk for side effects while using this drug. Caution is advised when using this drug in the elderly because they may be more sensitive to its effects, especially confusion and dizziness. Ranitidine should be used only when clearly needed during pregnancy. Discuss the risks and benefits with your doctor. Ranitidine passes into breast milk. Consult your doctor before breast-feeding. DRUG INTERACTIONS: The effects of some drugs can change if you take other drugs or herbal products at the same time. This can increase your risk for serious side effects or may cause your medications not to work correctly. These drug interactions are possible, but do not always occur. Your doctor or pharmacist can often prevent or manage interactions by changing how you use your medications or by close monitoring. To help your doctor and pharmacist give you the best care, be sure to tell your doctor and pharmacist about all the products you use (including prescription drugs, nonprescription drugs, and herbal products) before starting treatment with this product. While using this product, do not start, stop, or change the dosage of any other medicines you are using without your doctor's approval. Some products that may interact with this drug include: procainamide, propantheline. This medication decreases the amount of acid in your stomach. This can change the amount of medication absorbed from your stomach which may affect how these medications work. Examples of affected drugs include atazanavir, delavirdine, dasatinib, gefitinib, raltegravir, triazolam among others. Azole antifungals such as ketoconazole may also be affected. Check the labels on all your medicines because they may contain aspirin or aspirin-like NSAIDs (e.g., ibuprofen, naproxen) that can cause stomach irritation/ulcers. Ask your pharmacist about the safe use of those products. Low-dose aspirin, as prescribed by your doctor for specific medical reasons such as heart attack or stroke prevention (usually at dosages of 81-325 milligrams per day), should be continued. Consult your doctor or pharmacist for more details. This medication and similar H2 histamine blockers (e.g., cimetidine, famotidine) are available both over-the-counter and by prescription. Do not take them at the same time. This medication may interfere with certain laboratory tests (e.g., urine protein), possibly causing false test results. Make sure laboratory personnel and your doctors know you use this drug. This document does not contain all possible interactions. Therefore, before using this product, tell your doctor or pharmacist of all the products you use. Keep a list of all your medications with you, and share the list with your doctor and pharmacist. OVERDOSE: If overdose is suspected, contact your local poison control center or emergency room immediately. US residents can call the US national poison hotline at 1-800-222-1222. Canadian residents should call their local poison control center directly. Symptoms of overdose may include difficulty walking, severe dizziness/fainting. NOTES: Do not share this medication with others. Lifestyle changes such as stress reduction programs, stopping smoking, limiting alcohol, and diet changes (e.g., avoiding caffeine, certain spices) may increase the effectiveness of this medication. Talk to your doctor or pharmacist about lifestyle changes that might benefit you. Laboratory and/or medical tests (e.g., endoscopy, kidney function tests) may be performed to monitor your progress or check for side effects. Consult your doctor for more details. STORAGE: Store the US product in a tightly closed container at room temperature between 59-86 degrees F (15-30 degrees C) away from moisture and light. Store the nonprescription medication at room temperature between 68-86 degrees F (20-30 degrees C). Store the Canadian product in a tightly closed container between 35.6 and 86 degrees F (2 and 30 degrees C) away from moisture and light. Do not store in the bathroom. Keep all medicines away from children and pets. Do not flush medications down the toilet or pour them into a drain unless instructed to do so. Properly discard this product when it is expired or no longer needed. Consult your pharmacist or local waste disposal company for more details about how to safely discard your product.